This week skincare pioneer Biodermis released DermaSof, their 100% silicone, advanced anti aging skin repair serum for stretch marks. DermaSof harnesses the proven power of silicone for rapid improvement of stretch marks, fine lines, and dehydrated skin. Dermasof represents our latest effort to push the boundaries of silicone therapy for stretch marks. The result is a product that is truly superior to other available options. 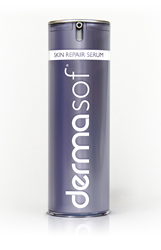 DermaSof is the latest silicone skincare innovation from Biodermis. According to Biodermis President, Marty Mitchell, DermaSof is an advanced silicone skin repair serum, unique among other stretch mark reduction products on the market. It relies upon the anti-aging properties of silicone to promote rapid improvement in stretch marks resulting from pregnancy, rapid weight gain, bodybuilding or similar situations where the skin has been stretched beyond its ability to expand naturally. When this occurs, the dermal layer of the skin will actually rip or tear, resulting in what are commonly called stretch marks. While stretch marks are not likely go away completely, DermaSof Silicone Skin Repair Serum will dramatically and rapidly accelerate and improve the body's ability to return skin to it's normal texture and pallor. "DermaSof represents our latest effort to push the boundaries of silicone therapy for stretch marks. The result is a product that is truly superior to other available options. Our research and development team has spent months meticulously crafting the final compound and has created something truly special with DermaSof." DermaSof works on existing stretch marks and as a prevention mechanism. For those suffering from existing stretch marks, a noticeable, immediate improvement to the overall elasticity and tone of the skin will be observed. The nourishing, hydrating effects produced by the fully encapsulating serum stimulate the body's natural repair response as moisture levels at the treatment site increase. DermaSof may also be used prophylactically (preventatively) for users who expect a rapid change in body size, such as pregnant mothers entering their first trimester or bodybuilder who are expecting to bulk up rapidly. "The market is flooded with snake oil and inferior products marketed to consumers who are eager for solutions to the challenges of maintaining healthy, beautiful skin. We have built our entire business upon the foundation of a singular ingredient that does what we claim it does—silicone works, and the American Academy of Dermatology will verify that statement. We are very proud of DermaSof, and with the level of domestic and international interest, we are excited to bring it to market." DermaSof is fragrance free, and contains no oils or dyes. It contains only 100% silicone, the only ingredient that has been clinically proven to improve the appearance of superficial scars, such as stretch marks. Many products on the market that claim to reduce stretch marks are simply mineral oils or sometimes animal oils, which serve no beneficial purpose for reducing stretch marks, and have not been clinically proven to do so. DermaSof is available in 15 ml and 30 ml sizes. Established in 1988, Biodermis has been recognized for its innovative contributions to the scar management , post-operative and skincare industries for more than 25 years. For more information regarding DermaSof, log on at biodermis.com or call (702) 260-4466.